A kiwi filling is swirled in a cream cheese base for a one of a kind pie experience. If you've never had kiwi and cream pie, you don't know what you're missing. I have a sad story to tell you. I am sitting next to an empty pie plate trying to decide what to tell you about this pie. So far I have "it was good" and "I wish there was more." But, alas there is no more. Darn! It all started because I had some kiwi that I wanted to use. I searched for ideas online, but I didn't want to make a smoothie or sorbet. There were some tasty looking salsas, but that wasn't what I had in mind either. So, I set off to make something on my own. What I ended up with was so tasty! 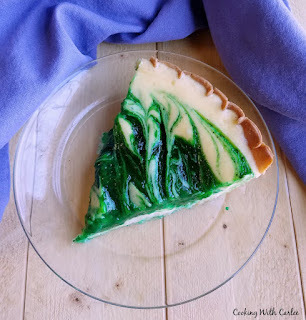 The kiwi added a light tart tropical flavor swirled into a cheesecake type base. This would be really good in a graham cracker crust too, but I didn't have any graham crackers on hand today. So, pie crust it was! After just eating a half of a homemade pizza, Matt still got a second piece, which almost never happens with dessert. He had to share one with Sam when he came by too. He made the comment that I could make it again whenever I would like. It always cracks me up when he says stuff like that. But I took it as a compliment. He had just gotten done telling me about how he really isn't into pies, other than his mom's apple pie, so I was happy to have one he would request again. I don't know why, but I just love that you can see the speckle of the seeds in the kiwi filling. So fun! then remove weights and bake for 5 more and set aside. Reduce heat to 350 F.
2. Peel and puree the kiwi. Mix kiwi and a half cup of sugar in a small saucepan. to simmer for a minute or two longer. Set aside and allow to cool. vanilla and salt. Mix completely. top. 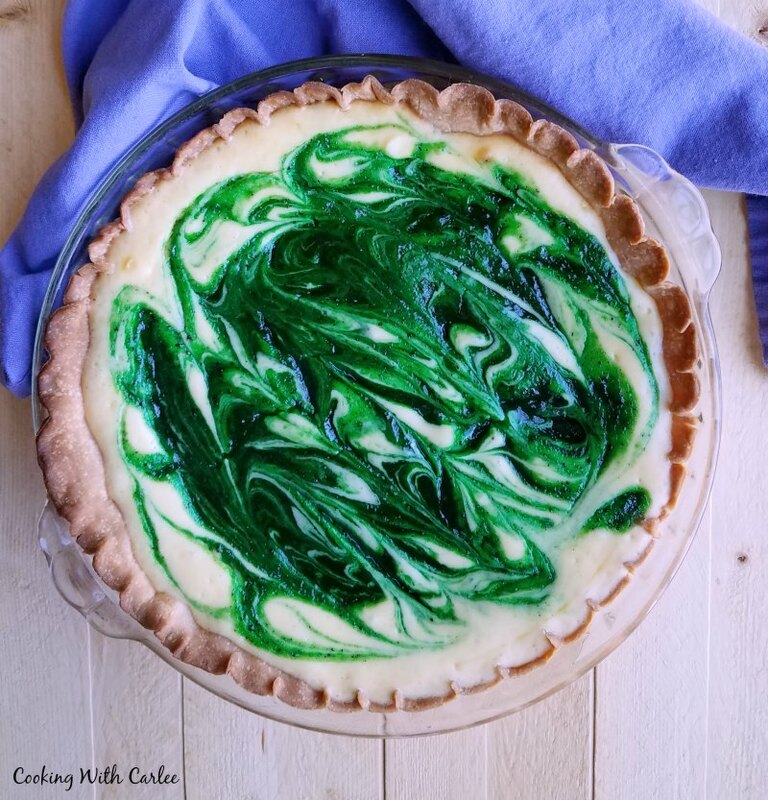 Using a knife, gently swirl the kiwi mixture into the cream cheese mixture. Bake at 350 F for 45-50 minutes or until barely set. 5. Cool for an hour, then refrigerate for at least 2 hours before serving. Wow so unique and beautiful! love the recipe for the kiwi and cream pie! I cannot wait to give this pie a try nom nom nom! Thank you! We were actually talking about it again at dinner tonight. We really enjoyed it! 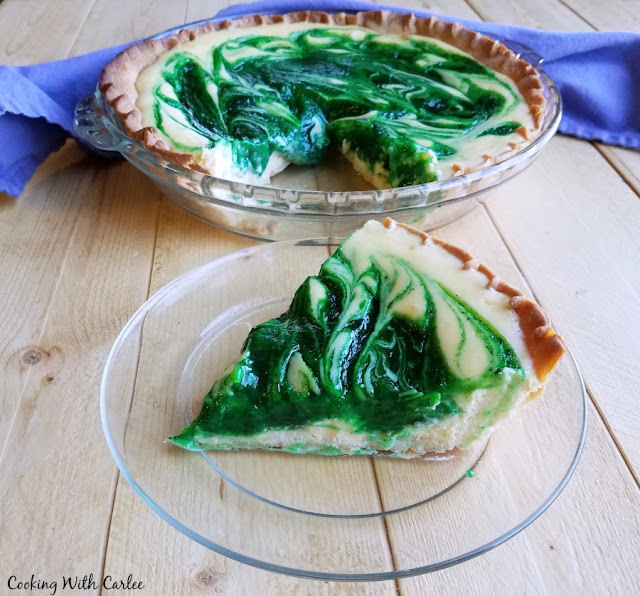 This pie looks incredibly delicious! The colour is so bright and spring-like! Great for Easter and St. Patrick's Day! Thank you! I was really excited with how it came out! Thank you! My husband is asking for another one ;-) Thanks for stopping by! What a great idea! My husband loves kiwi fruit so this would be a hit with him. Thanks for linking up at Mum-bo Monday! My husband has already requested another one! Thanks for hosting! What a great idea, this pie looks delicious! Happy St. Patrick's Day and thanks so much for sharing with Full Plate Thursday! Thank you! It is fun to do something a little different every once in a while. We really enjoyed it! Have a great week, see you Thursday! 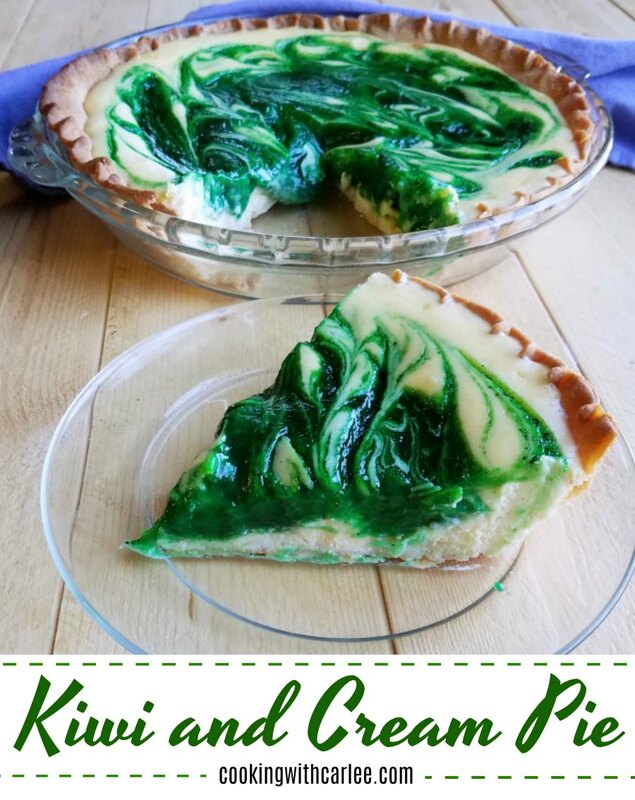 It never entered my mind to make pie with kiwi, but this sounds amazing! Thanks for sharing at the Homestead Blog Hop this week! It was my first time too ;-) I'm sure I'll do it again though! I've never heard of using kiwi in a pie. Where have I been?? Pinning and sharing. Thanks for sharing at Totally Terrific Tuesday last week! I can't wait to see what you have lined up for this week. I never had either, but I couldn't see a reason why it wouldn't work. I'm glad I tried it! See you Tuesday!